ATLANTA, GA – While the American Academy of Pediatrics recommends that children under five play outside as much as possible, an April 2012 study led by Seattle Children’s Research Institute found that nearly half of U. S. preschoolers did not have even one parent-supervised outdoor play opportunity per day. Recognizing that the lack of convenient outdoor spaces contributes to this trend, a growing number of parks and preschools are choosing synthetic grass for their playgrounds to allow more opportunities for young kids to be active. New synthetic grass playgrounds nationwide have reclaimed previously unusable spaces for the benefit of the community. Cumberland Park in Nashville, Tennessee was built on a former brown field industrial site adjacent to the Cumberland River reclaimed by park planners working closely with the Environmental Protection Agency and state environmental officials. With more than one million visitors expected annually, officials decided to install synthetic grass from ForeverLawn in heavy activity areas such as playgrounds and a climbing wall because of its durability, the option to incorporate safety features and ability to conserve water. The City of Henderson Parks and Recreation Department in Nevada manages aquatics and recreation centers and boasts 54 neighborhood and community parks. However soaring summer temperatures caused cracks, separations, peeling and fading in the poured-in-place rubber surfaces used in the playgrounds. They turned to SYNLawn to replace dilapidated rubber surfaces in five parks with synthetic grass, create more attractive, safer play areas for young children and kids of all ages. 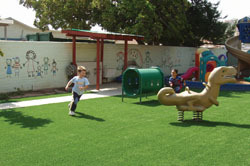 Daycare facilities have also recognized the benefits of synthetic grass playgrounds, like Home Depot’s Early Childhood Development Center at its corporate offices in Atlanta, Georgia. Located at the base of a steep grade, the unique playground from ForeverLawn features synthetic grass hills and valleys and even a lazy river defined by the winding blue turf. Special padding under the turf creates fall safety zones and the entire playground is ADA accessible.